Have you ever wondered how your app will perform on smaller screens, e.g. on a MacBook ? SmallScreen.app will simulate a small screen by putting an overlay on your big developer screen. You can choose Display Sizes like MacBook Air 11/13", MacBook Pro 13/15/17" or iMac 20/21/24/27". 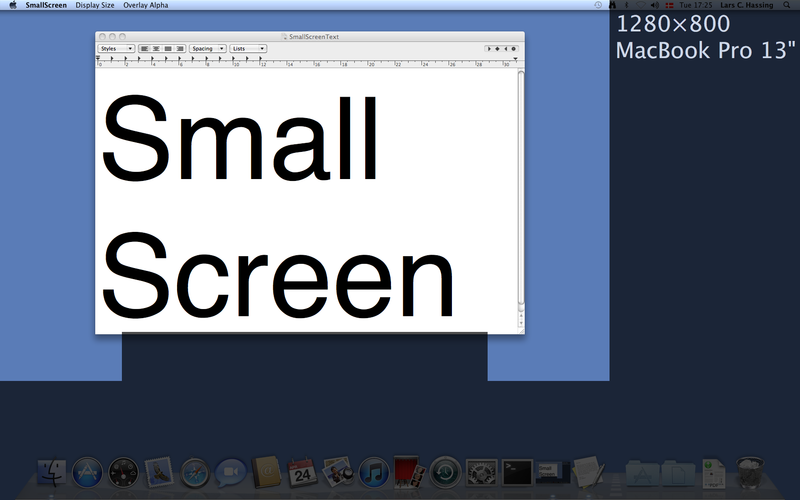 This screen shot shows SmallScreen running on an iMac 20" simulating a MacBook Pro 13". The overlay darkens the rest of your display and thus highlights what would be visible on a smaller computer screen. The overlay is a "click-through" overlay so you can still click in the darker area. SmallScreen.dmg (1.2 MB) containing the program SmallScreen.app.